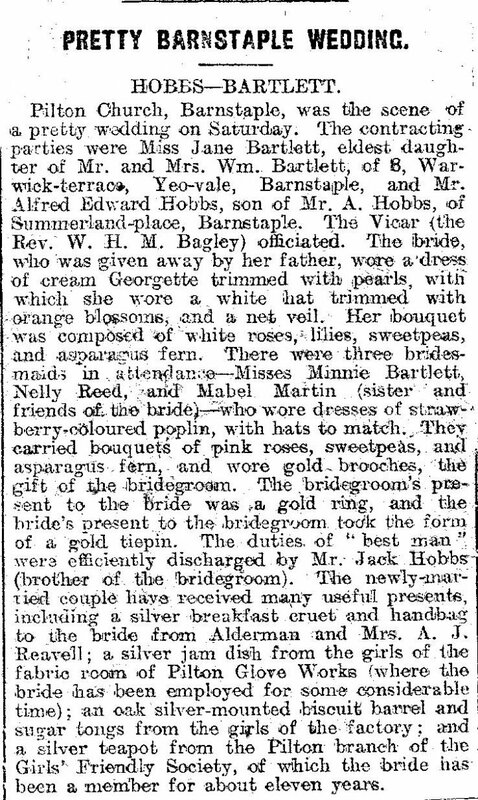 This is the report of the wedding of Jane Bartlett, eldest daughter of Mr William and Mrs Jane Bartlett of Warwick Terrace, Yeo Vale, Barnstaple, to Alfred Edward Hobbs, son of Mr A Hobbs of Summerland Place, Barnstaple published in the North Devon Herald of July 8th 1920. The Rev William Bagley of St Mary’s Church, Pilton, officiated. The bridesmaids were Minnie Bartlett, sister of the bride, and Nelly Read and Mabel Martin, friends of the bride. The best man was Jack Hobbs, brother of the bridegroom. Among points of interest were a present from the ‘girls of the fabric room’ of the Pilton Glove Works where Jane Bartlett worked, and from the Pilton branch of the Girls’ Friendly Society. Alfred and Jane Hobbs were the parents of the late Jane ‘Jennie’ Hobbs of Ladywell, Pilton. Thanks to Mary Passmore for recovering this cutting from among Jennie’s papers.